About the Wine: The Passaggio Wines 2015 GSM is made from 44% Grenache (Heringer Estates, Clarksburg) 44% Syrah (Fieldsa Vineyards, Sonoma) 12% Mourvedre (Heringer Estates,Clarksburg). Flavor Profile: Build me a cabin in this forest, where I can breathe in the scent of fresh lumber; where I’m surrounded brambly bush berries that have fallen to the ground in the damp, dirty, gritty soil. Pop the cork of the Passaggio Wines 2015 GSM and be there with me. On the pour, this Rhône-style red blend looks like river water, a slightly rusted red tinted with grey, as if stained from the river’s pebbly floor. 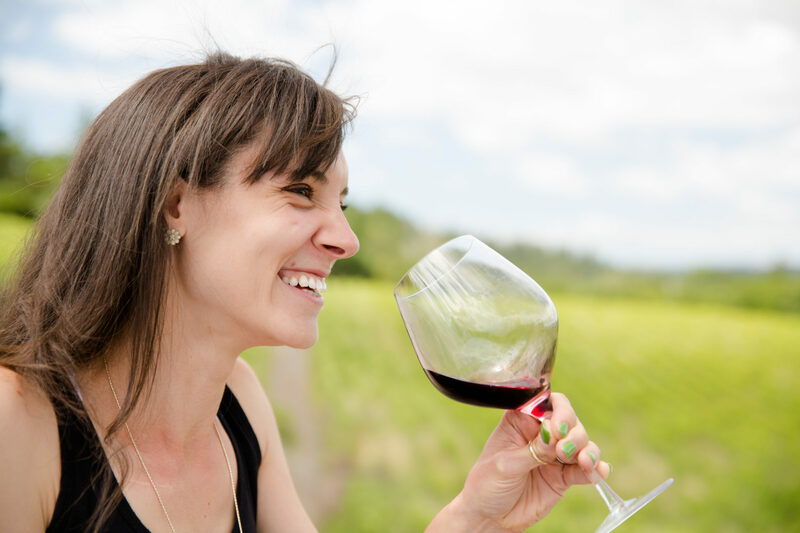 Yet, the wine settles into the glass with a bit less rusticity — it’ a more feminine, jewel-like pink-red. Initial aromas are of red roses, cedar wood, dried eucalyptus leaves and bark, black cherry, and a clear, solid, strong acidity — you just know more fruits are buried in this forest floor. So swirl and smell again to find additional scents of green fig, boysenberries, rose bushes, and a background of a perfume-meets-cologne. On the palate, the Passaggio Wines 2015 GSM Red Blend is smooth and soft like a pillow. Initial flavors are of black cherry, toasted vanilla bean, green figs, and cola. The tannins are plush, giving the wine a medium body, and there’s no cloying dryness. In fact, there’s no dryness at all until the very tail end, and even at that moment it is like the slow steady decline of a rolling hill. The acidity is at a constant medium level throughout, elevating the fruits and playing with a bit of heat and spice-fulness. The finish includes a tingle of warmth throughout the mouth with just a light sheet of silky tannins coating the tongue with an essence of freshly stripped tree bark. The finish is at least a solid 20 seconds long and the aftertaste is an indulgent surprise of unsweetened cacao and fresh mint leaves. 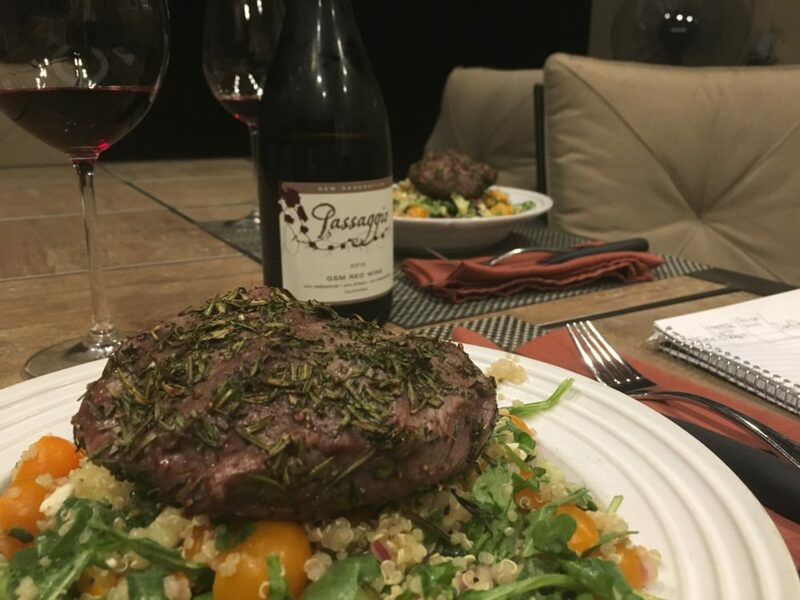 Food Pairing: I paired the Passaggio Wines 2015 GSM Red Blend with a rosemary and thyme crusted lamb sirloin on top of my Mediterranean quinoa salad. This was the perfect pairing, indeed. The cherry tomatoes as well as the kalamata olives tossed in the salad brought out the sweetness of the black cherry flavor in the wine, while the feta brought out the plush herbaceous-meets-vegetative notes. And the lamb — with its gamey juices and soft, thready texture — brought out the grit of the earth, the trees, all those solid elements that create the foundation of a forest and the backbone of a great wine. More Info: I received the Passaggio Wines 2015 GSM Red Blend as a sample for review. (Cheers Cindy!) Retail: $49 For more information about Passaggio and to purchase wines directly, please visit the Passaggio Wines website. we are huge fans of Cindy!!! And did you know she is now producing a CabFranc?!!!! !